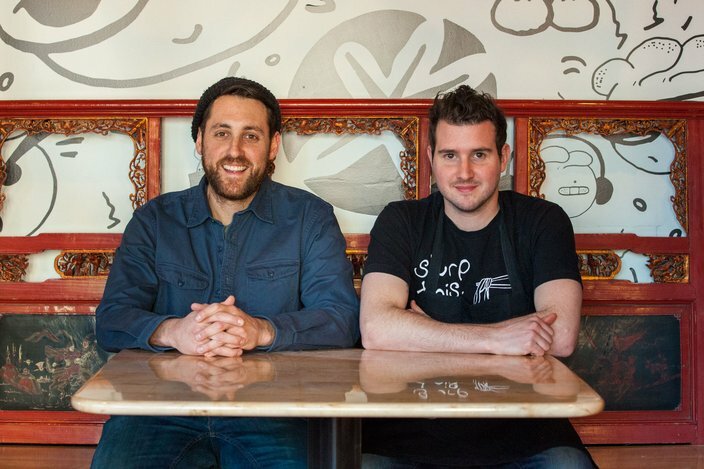 Co-owners Shawn Darragh, left, and chef Ben Puchowitz. 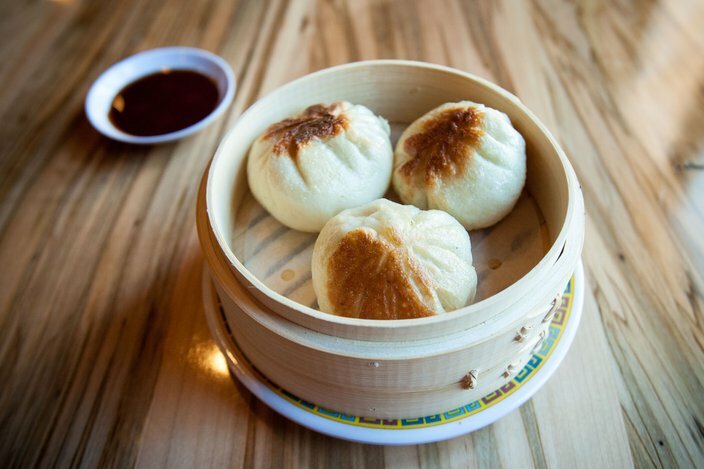 Dim sum lovers and fans of the always-packed Cheu Noodle Bar won’t have to wait much longer for the hotly anticipated debut of Bing Bing Dim Sum. Co-owners Shawn Darragh and chef Ben Puchowitz plan to open their new East Passyunk spot on February 16 or 17. The project has been in the works for about a year, when the duo returned from a trip to Hong Kong and Japan in January 2014. “We got all inspired and then got on our hunt quickly” for a location, Darragh said. They received a tip that the old El Zarape was closing and signed a lease last March. “It was a bigger space, and the idea of dim sum here worked because there’s nothing around here that does it. 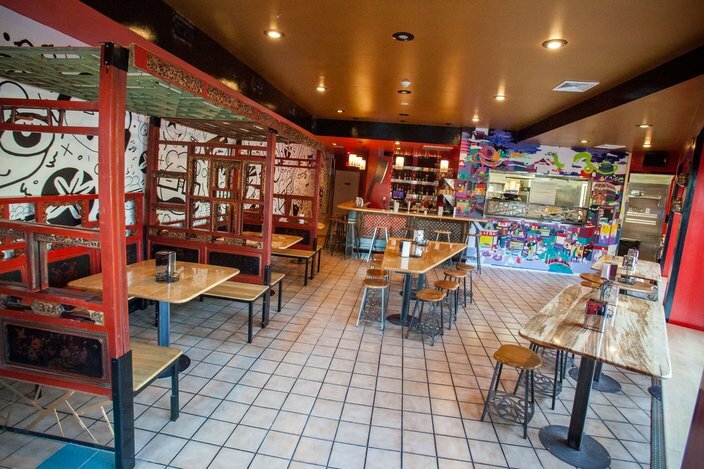 Even on Washington Avenue, it’s all Vietnamese food,” Puchowitz said. “We’re very far from Chinatown,” adds Darragh. Following the success of Cheu, it was an easy business decision for the partners to branch out into dim sum. 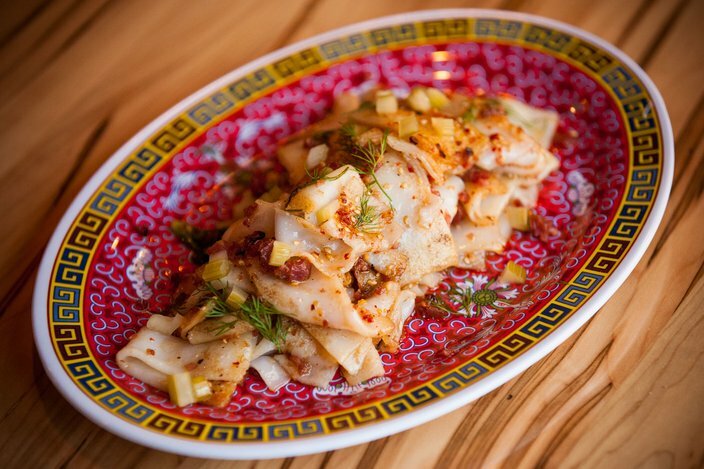 “Ramen was hot about two years ago; now dumplings are hot,” Puchowitz said. “We’re just trying to catch the waves before they hit Philadelphia,” Darragh said, laughing. Bing Bing will have a vibe similar to the diminutive Cheu (“loud and dark,” says Darragh), with one major difference: It’s ideal for groups. “If you want to come with a big party, this is the place,” Darragh says. There’s a large triangular communal table in the center of the dining room (echoing the shape of the building), as well as two picnic-style tables along the windows on Passyunk. An interior shot of Bing Bing Dim Sum. Thom Carroll/PhillyVoice. Sculptor-designer Andrew Jevremovic (Kraftwork, La Colombe, Greenstreet Coffee) made the tables and stools from a mix of Pennsylvania hardwoods and steel at his Octo Studio in Point Breeze. Jevremovic incorporated Asian design elements throughout the restaurant, such as the three Chinese wedding beds he found years ago in Fujian Province that function as booths. 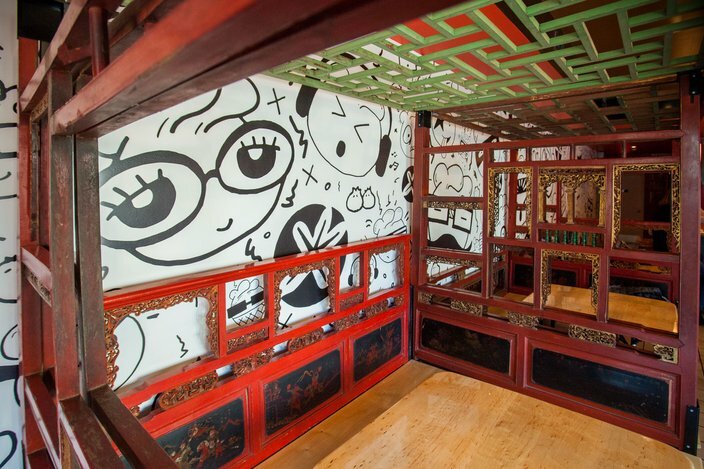 Imported emperor beds from the Fujian Province in China serve as three large booths in Bing Bing's dining room. Thom Carroll/PhillyVoice. Wooden Chinese windows lined with Vietnamese newspaper serve as the base of the eight-seat maple bar, and a scary-looking oversize chef’s cleaver, also custom-made by Jevremovic, hangs on the wall behind it. 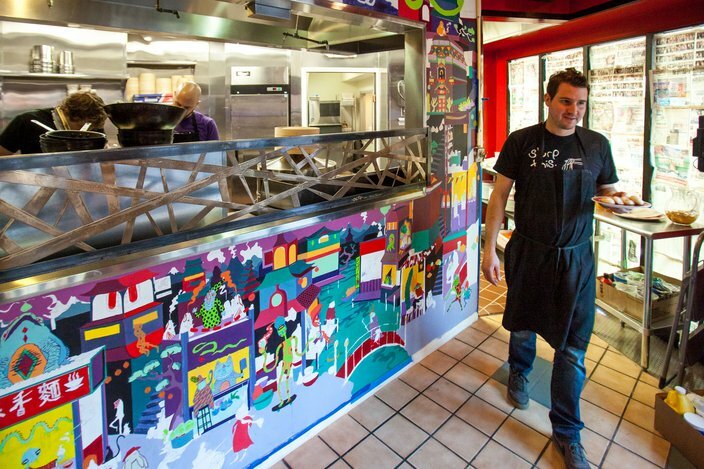 Artists Mike Wert and Val Volkova designed the colorful mural inspired by a Hong Kong street scene on the wall between the kitchen and dining room. “It’s a weird, trippy type of thing,” says Darragh. 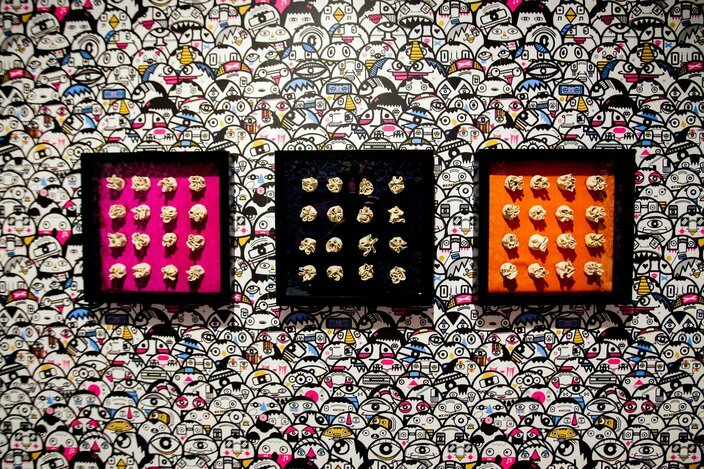 Designer Jon Billett came up with a cast of quirky dumpling characters that pop up on menus and along an entire wall of the restaurant. The Hong Kong street scene that frames the kitchen is the work of Philly artists Mike Wert and Val Volkova. Thom Carroll/PhillyVoice. 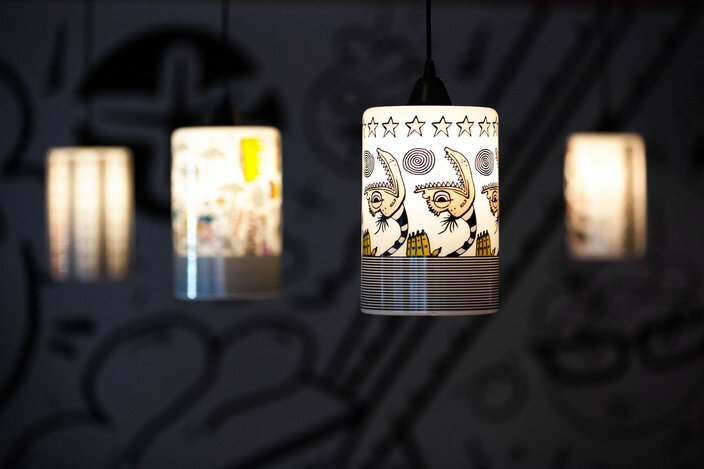 Puchowitz’s family even contributed to the aesthetic, with pendant lights created by his brother Zach, a glass artist, and framed clay dumplings made by his mom, Sue. Ben Puchowitz's mother, Sue Puchowitz, an artist based out of Cheltenham, created these 48 dumplings out of clay. Thom Carroll/PhillyVoice. The lamps illuminating the bar were hand-blown by Puchowitz's brother, local artist and sculptor, Zach Puchowitz of OuchKick Studio. The kitchen boasts a custom-made wok steamer and has prep counters along the windows on Passyunk Avenue. Because of space constraints, Darragh and Puchowitz decided against traditional dim sum cart service; the dumplings will be made to order in steamer baskets. At Bing Bing, Puchowitz will do dim sum the way he does ramen at Cheu: familiar flavors, but with an emphasis on his personal taste and preferences. “I’m using what I’ve learned in fine dining and French kitchen technique—so it always kind of turns out a little different than what would regularly be an authentic Chinese dumpling,” he says. Pan-Fried Bao with Reuben filling. Thom Carroll/PhillyVoice. Soup dumplings fall under the “Doughy Things” section of the menu along with Pan-Fried Bao with Reuben filling and shrimp-and-leek-stuffed Jade Dumplings. Potato dumplings with fresh horseradish and dill are one of several gluten-free and veg-friendly options. 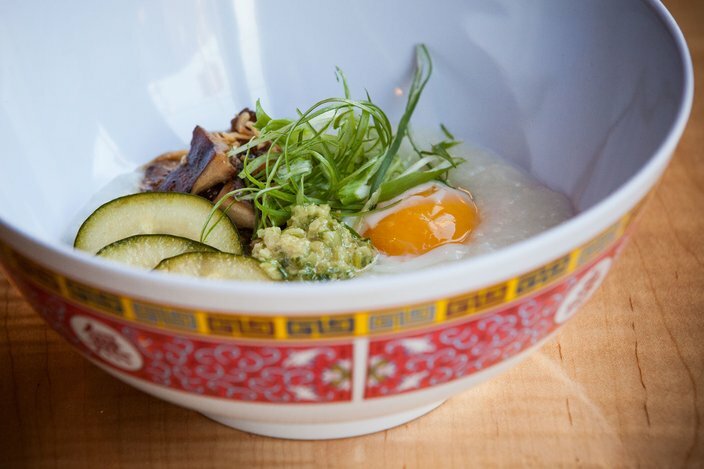 Rice Porridge with barbecued mushrooms, soft egg and crispy onions. Thom Carroll/PhillyVoice. Puchowitz is excited about the Lamb Ribs with black bean sauce and pickles, one of the “Kitchen Specialties.” Others include Rice Porridge with barbecued mushrooms and soft egg, and Chow Fun with Chinese sausage and hot bean paste. Chow Fun with Chinese sausage, hot bean paste and dill. Thom Carroll/PhillyVoice. 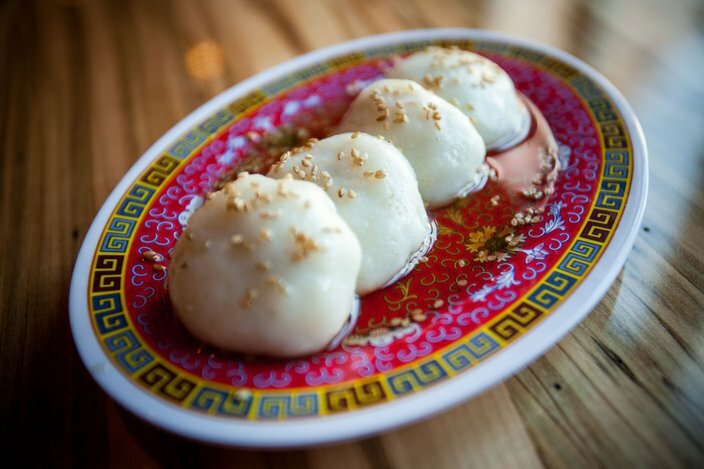 For dessert (“Sweet Things”), Steamed Rice Balls are filled with sweet red bean paste and topped with sesame syrup. The Bubble Waffle with coconut dipping sauce also sounds like a winner; it’s Puchowitz’s take on the popular Hong Kong street snack. Steamed Rice Balls are filled with sweet red bean paste and topped with sesame syrup. Thom Carroll/PhillyVoice. Max Sherman (formerly of Percy Street Barbeque) put together the beverage program, anchored by three “Happy Family” cocktails. “They’re large-format drinks, punch-y style things,” says Darragh. The “Tiger Style”, for example, is a concoction of bourbon, barley tea, allspice tamarind dram, umeshu, lemon and Sichuan ginger beer. 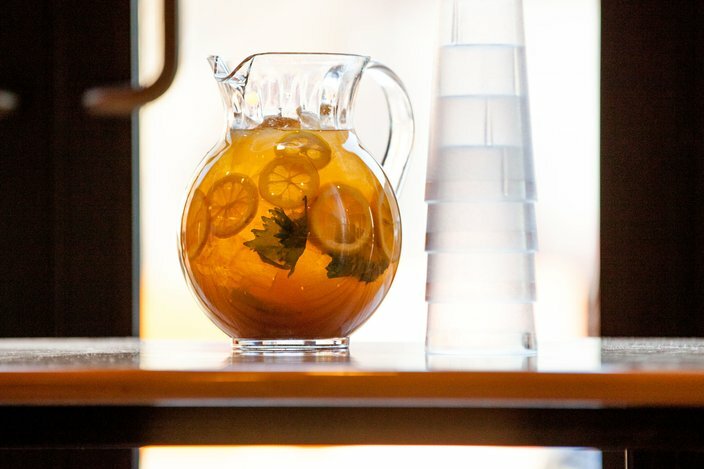 Tiger Style, ("like Wu Tang Clan," says Sherman), consists of Heaven Hill, house-roasted barley tea, allspice tamarind dram, umeshu, house-made Sichuan ginger beer and lemon. Thom Carroll/PhillyVoice. In addition to cocktails and wine, Bing Bing will have Victory Lager, Lagunitas IPA and a rotating Sixpoint on draft, and a selection of bottles and cans. Initially, Bing Bing will serve dinner only from 5pm to midnight (bar will be open until 1 am). Eventually, Darragh and Puchowitz will add morning and afternoon hours on the weekends. When the weather breaks in the spring, they’ll fling open the windows and doors. “We have 35 outdoor seats that’ll run all along Passyunk Avenue,” says Darragh. 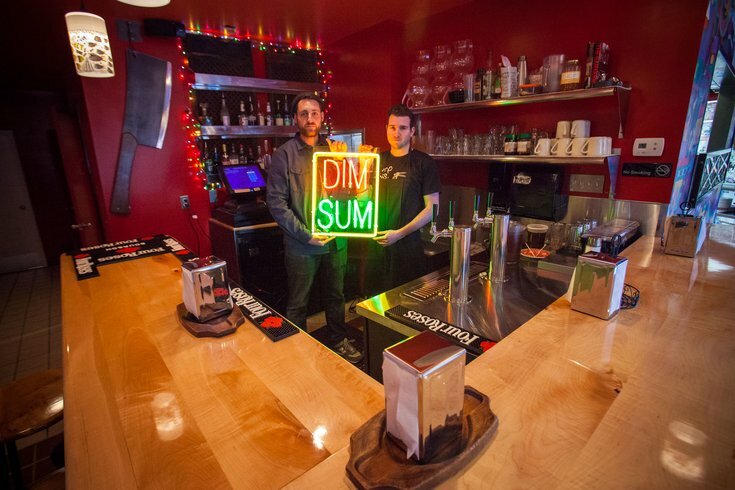 Bing Bing Dim Sum opens mid-February at 1648 E Passyunk Avenue.